Thomas DAM’s Tailed Trolls came in 3 sizes – the largest is 6 ½” tall (to tip of left ear). Smaller ones are HARDER to find (2 ½” to 3 ½”), especially the medium ones with the moveable head. The large and medium sizes have a moveable head, large pointy (Vulcan) ears, but only the large and small size have fingers and toes with carved nails. All sizes have glass eyes, genuine Icelandic wool hair on head & end of tail. The original outfit (for the large) consisted of burlap-type tunic, 2- lucky charms with leaf shaped piece of felt (either red, green or yellow) all tied around waist on brown yarn and sometimes can be found with the original round red paper tag. The medium tailed troll had only the burlap-type tunic secured in front w/ a brown yarn and a scrap of felt. The small tailed troll had no clothing (also NO moveable head), but came with a wide variety of eye and hair colors. Very hard body made by Royalty Designs of Florida Inc (Hialeah, FL USA) and officially licensed by DAM Things Originals. Large size- 6 1/2” (style #700– originally sold in 1965, for $24.00 a doz); these large tailed trolls will sell for between $120 up to $500 . . . depending on hair/body condition, if troll is original, or if accessories & original clothing/tags are also available with it. Large tailed troll came with burlap tunic, brown yarn tie, two charms, leaf-shaped felt, GOOD LUCK hang-tag and passport. Marked on right foot- © DAM Things Est. 1965 and on left foot a large ©. Smaller size– 2 1/2” (style #702— originally sold in 1965, for $7.20 a doz); the smallest tailed troll seems to be selling for between $150 to over $600 . . . depending on condition. Small size was sold naked. But came with different eye colors. Marked on right foot (similar to large troll)- © DAM Things Est. 1965. 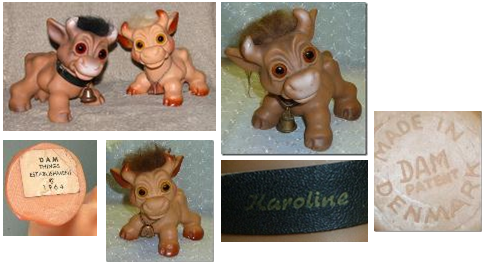 A very rare 9 1/2” walking tailed troll (only a few 100 pcs made) , sold on e-bay (Sept 2011) for over $500. Please keep in mind that the going price for ANY of these tailed trolls (or any DAM troll in general), will depend on condition of the troll and what interested buyers are willing to pay. For more info on tailed trolls and a picture of the original 1965 advertisement/brochure showing these unique trolls go to the Evertroll website’s info on Vintage Tailed Trolls. Large Thomas DAM Troll Cow, was made in mid-1960’s . There were 2 types of large cows made: a lighter (harder body made in the USA) , which came w/ a ball chain and bell that is marked on bottom of right hoof– Design DAM Patented (many cows are also unmarked or came with paper tags on their feet– see photo at the left), this cow usually has light amber glass eyes. These cows have a moveable head, glass eyes and genuine icelandic wool tuft. About 6 3/8” high. Depending on condition one can expect to pay between $75 up to $175. The other cow is a darker (squishy body), which came w/ a leather collar imprinted with the name “Karoline” and bell. She is marked on back right foot– MADE IN DENMARK DAM Patent, this one usually has darker amber glass eyes. The darker colors (European DAMs) are a little harder to find than the lighter flesh tone one, and may fetch higher prices than their lighter sisters. DAM also made smaller cows, of two types (click on hyper-link to see more picts). One type with moveable head and leather collar w/ bell, a very rare small (2.5” hi) light (white) colored cow with moveable head and spots fetched over $700 on ebay in Jan 2012. Small cows with moveable heads will usually start around $100 and up. The other small DAM cow (with no moving parts) will start around $50 and up. Thomas DAM Troll Donkey, (not a horse) is marked on front left foot- © DAM THINGS EST. 1964. This donkey is very hard plastic (made in the USA under DAM patent) and has etched fur lines in his body. A moveable head, glass eyes, with genuine Icelandic wool mane and tail. Stands about 8 ¾” high. Depending upon condition one can expect to pay between $75 up to $200. In the photo with the first donkey with peach hair is a small sitting donkey finger puppet which was made in 1964 it is marked- © Dam Things Establishment 1964. It has a tuft of genuine Icelandic wool hair and amber glass eyes. These guys came with a variety of hair colors. Stands 2 3/4” high, they will usually sell on the secondary market for $25 and up. The light body Thomas DAM Troll Elephant with its original round paper tag. Left foot is marked DAM. This all original elephant is a very hard plastic and has etched wrinkles in his body (made in the USA). Has a moveable head, amber glass eyes and genuine Icelandic wool hair. Stands about 5 ½” hi. Depending upon condition and color one can expect to pay between $100 up. The darker soft body (or unusual) flesh tone European DAM elephants with darker amber eyes are less common and can bring in a little higher prices. Especially rare and HTF is the “high-back” DAM elephant which stands taller and has longer legs, you can expect to pay a premium price for him, a minimum of $700 and up, one recently sold on e-bay for around $1,000. The high-back has a different skin tone and dark amber glass eyes, photo at the left shows a normal size DAM elephant with the high-back and a little DAM finger-puppet elephant. Click on hyper-link to view some of the other DAM elephants and the different varieties of colors. Any of the older DAM animals from 1960’s are a worthwhile investment and will usually command a higher price than the regular trolls (with the exception of the tailed trolls or other unique/ prototype DAM trolls which are also sought after by many collectors). In the 1990’s DAM produced a LIMITED EDITION group of replica troll animals (limited quantities of each of– cow, elephant, lion and horse), made from DAM’s original molds from the 1960’s. These had brown plastic eyes and synthetic hair (with the exception of the HORSE who had genuine Icelandic wool hair). The horse also came in two different flesh tones- a lighter flesh-tone with peach or light brown hair and grey-flesh tone with hot-pink hair. For more detailed info on DAM LE’s click on hyper-link or photo of LE animals shown above. 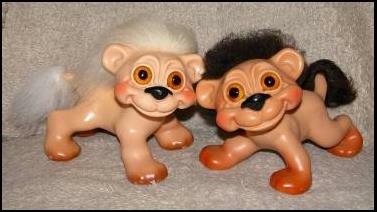 These troll animals came with gold paper tags that had the DAM logo on one side and LIMITED EDITION on the other side. They were marketed by E.F.S. Marketing Associates (of Farmingdale, NY) and were geared for sale towards the Norfin FAN Club members and specialty toy stores. The picture below shows some of the older DAM trolls these usually have GLASS eyes, but some like the Troll BANKS or some Iggy’s actually had plastic eyes. Shown in picture (left to right) all originals; 12” hard-body Army troll (aka– Iggy) with original vintage outfit, 7” soft-body girl with original felt clothing, hard-body girl troll bank with lemon wool hair & blue plastic eyes, naked 7” soft-body boy, 6.5” hard body girl and the original tiny hard body 3” DAM, some of these trolls are more commonly found and currently do not seem to be in as high of a demand. Most older DAM”s had the genuine Icelandic wool hair, but there are a few older ones out there with the fake (fun) synthetic hair. One can expect to pay anywhere between $5 (for the small size) up to $125 (for larger size) for these . . . depending of course on condition of the hair and eyes, if they have original clothing, as well as if they are in good shape, if they have original tags, size and if they are rare, etc. DAM’ trolls with the original paper or plastic tags, stickers, packaging (or DANMARK passports) will generally command a higher price. As will those w/ their original wool hair, eyes, clothing & accessories. Shown below are two Dam twins made in USA, in all original condition with tags & passports. The DAM Troll Viking from 1960’s with his original plastic tag still attached to wrist. For this unusual DAM Viking troll in good original condition, one can expect to pay between $100 to $200. Vintage European DAM trolls will be marked with country of origin (Made in Denmark), those marked DAM (with paper tags, passports or stickers) are usual referred to by collectors as American made DAM’s (made for DAM Things Originals by Royalty Designs of Florida Inc). DAM also made “advertising/promotional” trolls check out the similarity in outfits between the1960’s vintage Monkey boy to the later 1970-80’s sailor boy. The “condition” of the troll’s hair will also play a factor in how much a buyer is willing to pay. Due to the age of these it’s HARD to find vintage HAIR still in GOOD condition. 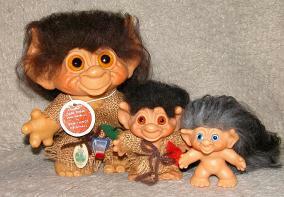 Trolls w/ poor (or no) hair, dry-rotted (see photos below for examples), matted, balding, ect . . . .will usually bring in lower $. The original DAM trolls had nice long flowing hair. If hair is pulling off the leather, matted/clumpy, very short or flaking, it’s a good indication that it’ll need to be replaced. Of course ALL trolls can have their hair replaced and some collectors will still pay a good $$$ for them, perhaps not as high a $$$ for those with their original hair in good condition . . . but still some collectors will buy in almost any condition. Even the two poor donkeys (shown in pictures below) basically had no tails, the pelt on one was just stubble and the other donkey had dry-rotted hair (hair was actually lifting off the leather). A large tailed troll in poor condition with its tail chopped off was recently posted on e–bay, yet despite these conditions they did sell. The light body Thomas DAM Troll Lions, were made in the USA in the mid-1960’s (many of these light flesh tone lions have NO identifying marks, they came with round red paper “Good Luck Tags”). Many hard-core DAM troll collectors know how to recognize the real lions from the fakes (check the Evertroll website for more info on how to spot fakes, or click on picture below of the post—How can I tell if my troll is a real DAM?). These lions have moveable heads, glass eyes, their mane and tail are of genuine Icelandic wool hair. About 5 ½” high. Depending on condition one can expect to pay between $45 to $95. These are more common and easier to find of the troll animals. The European DAM Lion (photo below) has a darker as well as softer body it is marked on right foot—MADE GjOL DENMARK & on left foot– DAM PATENT. It sits lower to the ground, also it has a darker amber glass eyes, these usually sell for a little more than the lighter flesh tone lions. Tail is a little “puff” of Icelandic wool & it aims downward. Expect to pay $75 or higher. The light flesh tone Thomas DAM Troll Giraffe (normally NO identifying marks) on those made in the USA many came w/ a simple round paper red “Good Luck” tag or white sticker on foot, but I’ve seen a few rare ones marked on right rear foot– Thomas Dam, Denmark –OR— Thomas DAM, Made in Denmark. USA made giraffes have “round” spots on their bodies. The body is made of 2-piece construction at the center permanently joined. Only the head is moveable, has glass eyes and genuine Icelandic wool hair. Depending on condition one can expect to pay between $75 up to $125. Stands an impressive 11.5” high. The DARKER European DAM Giraffe has a softer body (see photo at left), and darker amber glass eyes. European giraffes have “diamond” pattern spots on their bodies. Head is moveable, body coloring can vary from a light mocha to milk chocolate. This European giraffe IS marked on the right rear foot– Thomas DAM MADE IN DENMARK. He will usually will bring in a higher price than the light colored giraffe on the secondary market between $150 up to $200. Taller than lighter version, stands 12.5” high. The USA made DAM Turtle Troll is marked- © DAM THINGS EST. 1964 DESIGN DAM. This turtle is a little harder to find than many of the other animals. No moveable parts, stands about 3 3/8” hi & 5 ¼” long. Has glass eyes and genuine Icelandic wool hair. Depending on condition one can expect to pay $100 up to $250.